We’re just a few hours into the 2019 NACHC Policy and Issues Forum (P&I) and already there’s been a frenzy of activity. Thousands of health center advocates have arrived and there’s a heightened buzz of excitement about making a fresh case to Capitol Hill lawmakers about the value of Community Health Centers. To get the ball rolling, NACHC hosted a packed Congressional briefing, entitled, “Health Centers – Addressing America’s Health Care Need.” Congressional staffers heard about a new issue brief just released: “Community Health Centers: A Guide to a Vital Network of Care.” They also heard from a panel of health center leaders (see press release) about their work on the front lines responding to public health challenges — such as the national opioid use epidemic, HIV/AIDS and the scarcity of options for care in rural areas. The national gathering [see media advisory] and the advocates’ push for long-term, stable funding generated some local headlines in several states, such as California, Kentucky, Ohio, Texas, and Washington State. As we meet with lawmakers this week and throughout the year in our hometowns and states, let’s make sure every one of them understands our value and worth – what Community Health Centers deliver and what they mean to our communities. Let us tell our success stories about improving health, reducing health care costs, managing chronic disease, providing jobs, responding to emergencies and public health crises. Let us show that we are more than providers of care; we are innovators developing new and better approaches in the delivery of care and that we are problem-solvers, working with stakeholders and partners, helping to meet costly community health problems… Health centers were founded on a storied past, but represent the future of health care in America. Keynote speaker Former Senator Tom Daschle contributed observations about the political environment confronting lawmakers who are tasked with making budget decisions and setting priorities for the nation’s spending and where health centers fit in the national dialogue. People are concerned about drug prices, they are concerned about protecting their pre-existing conditions, high insurance premiums, and the closure of rural hospitals. We have to remind people each and every day how important the Community Health Center Movement is and how critical it is to the lives of people. You have an advantage other associations can’t talk about: you are local. And you don’t shy away from the difficult issues – you have taken on HIV, you have taken on opioids, you have taken on rural health care when hospitals are closing. Later in the General Session, a panel of health center leaders underscored the importance of sharing stories and data with Members of Congress not only about the success of the health center model, but also the importance of Medicaid integrity and the vital importance of workforce building programs, such as the Teaching Health Centers and the National Health Service Corps. Tomorrow advocates will take the Capitol by storm in delegations, wearing the color blue to identify themselves as health centers advocates. Stay tuned for tomorrow’s report. 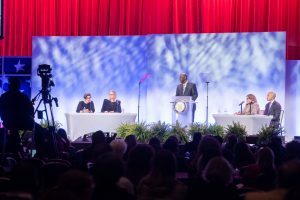 Follow the excitement online at #NACHC19PI.